Student engagement is emerging as a key focus in higher education, as engagement is increasingly understood as a prerequisite for effective learning. 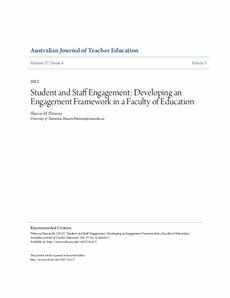 This paper reports on the development of an Engagement Framework that provides a practical understanding of student (and staff) engagement which can be applied to any discipline, year level or course. The Engagement Framework proposes five non-hierarchical elements: personal engagement, academic engagement, intellectual engagement, social engagement, and professional engagement. As well as describing these elements, the paper also explores the theoretical foundations of the Engagement Framework, including a recognition of the importance of conation as one of three faculties of the mind alongside cognition and affect. By adopting this Framework, the Faculty aims to enhance unit design and development, teaching practice, and student support practices.